Despite what many brand marketeers try to tell us, true luxury isn’t about labels or bling. True luxury can be divided into three basic elements – time, comfort and space. If you have this triumvirate; the time to enjoy, the space to spread out and the comfort to appreciate, only then you are experiencing true luxury. And few fifty-foot yachts encompass these three pillars quite like the brand new Princess V50 sports yacht from Princess. That the V50 is a luxurious boat is without question. Even before stepping aboard it is self-evident in the sleek coupe profile, neat detailing including next generation arrow shaped hull windows mirrored perfectly by the engine vents. But that form is not at the expense of function – side decks wide enough to walk easily along without resorting to crabbing sideways, protected by deck rails high enough to reach without stooping being just one example. 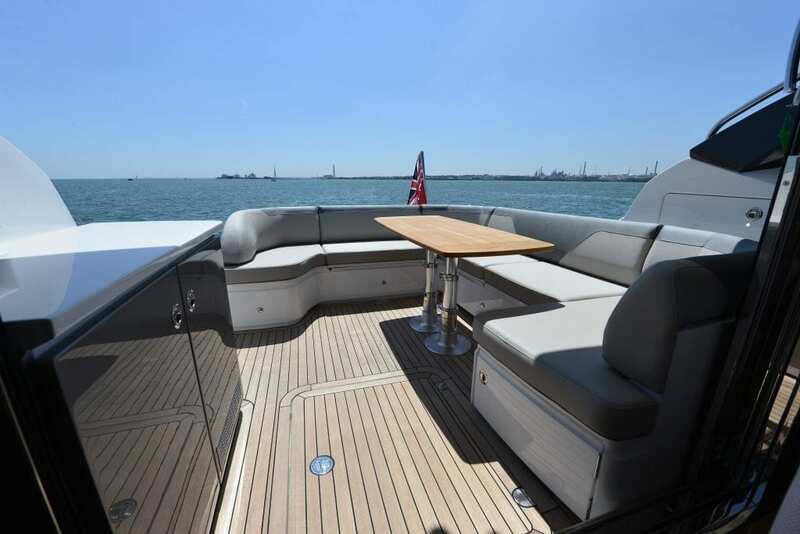 Available in two versions, you can have your V50 in Open format with the main deck laid out entirely to open cockpit beneath an open backed hard top, a dinghy garage tucked beneath a large sunpad, perfect for those long lazy days in the sun. Or you can opt for the deck saloon version we have here. 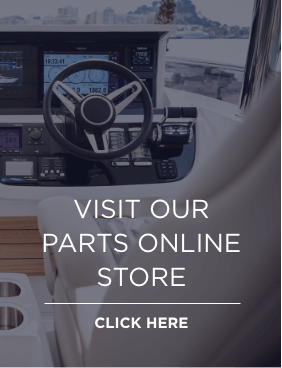 Both boats run the same Volvo Penta IPS600 pod drive system giving easy fingertip joystick control in close confines combined with serious thirty plus knot performance underpinned by a deep vee offshore hull that allows the yacht to maintain those high speeds, shrinking distances and gaining you time. Time to explore further or enjoy the destination for longer – the first pillar of true luxury. For the deck saloon model, the hydraulic bathing platform takes on tender storing and launching duties and the sunpad is swapped for a generous cockpit catered for by the bar installed in the same area. And that in turn creates a deck saloon that can be linked seamlessly to the cockpit via wide opening sliding glass doors. Inside is another terrific social space, the entire port side laid out to a comfortable sweep of seating for lounging or dining. Opposite, a long sideboard offers plenty of storage as well as concealing a flat screen TV that rises from the unit on demand. 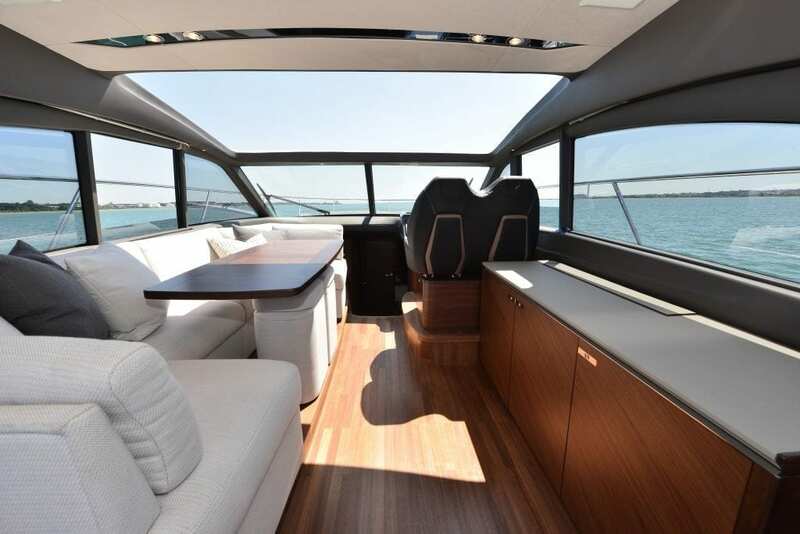 The double helm forward offers a commanding driving position, perfect for exploiting the performance while twin electric drop windows and a massive sliding roof connect you and your guests to the elements, putting you in touch with the sea and the sky. But just as effectively, they allow you to banish extreme heat or cold and completely control your climate under way or at rest via powerful reverse cycle air conditioning, creating the ultimate in comfort, that second pillar quietly and completely executed. But where the V50 really nails the hat trick of ultimate true luxury has to be in the sheer space found on board. Generous though that main deck is, it’s once you descend to the lower deck that the talent of Princess designers and genius of its layout really shines through. From the full height fridge freezer to the all-electric cooking including a ceramic hob to space for a dish washer, this is home from home kitchen facilities, whether it’s whipping up a quick sandwich or catering for a wonderful aquatic dinner party. There’s an L-shaped dinette opposite, creating a discrete snug tucked away for quiet breakfasts or a cozy evening drink (or specify this area as a third cabin). Head forward to find a large double berth cabin, elbow room evident everywhere from the sheer amount of floor space to en suite access to a bathroom of a size and quality that echoes a good boutique hotel. Impressive enough, but doubly so when you consider that this is only the guest accommodation. The master suite is back aft, mere cabin sells it short. A square bedroom with full standing headroom lit by those large signature hull windows, it’s an oasis of spacious calm with a settee tucked against one side and a large chest of drawers built into the other. Even the wardrobe follows the theme, double doored, illuminated and full height, proving that floor space doesn’t come at the expense of storage, a theme echoed yet again by another huge bathroom. Many fifty-foot yachts offer some of these benefits, they go fast or offer big cabins. 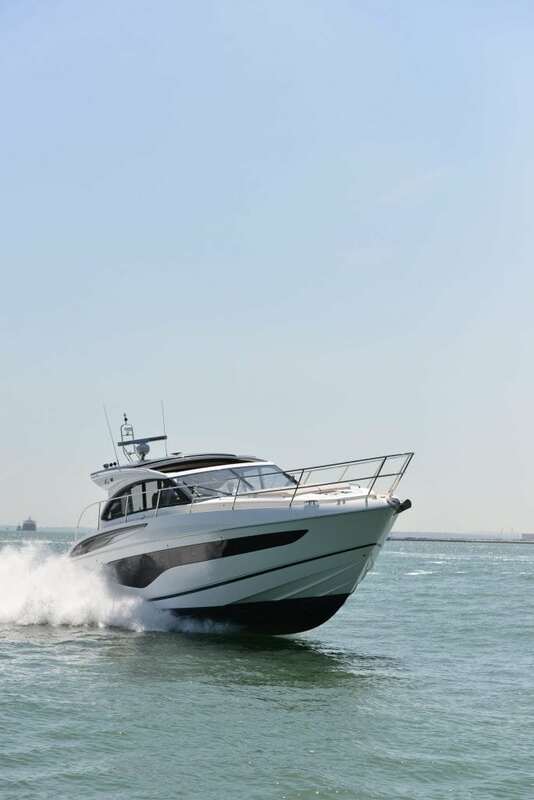 What the Princess V50 does is offer that performance without the compromise, giving the owner and his lucky guests all the time, space and comfort they could ever need. True luxury.